SE-1200MU along with the RMC-260, is the only 6-input production switcher in the world that can switch over IP, computer interface or a control surface; all for under $2,000. SE-1200MU is the most affordable, versatile production switcher on the market which could be put in nearly any production application, including live events, worship, broadcast and education. IP Control: SE-1200MU has the ability to stream its multiview in real-time to a PC for monitoring and controlling remotely. Designed to be fully controlled from any Windows Laptop/Mac with the included SE-1200MU software control interface. 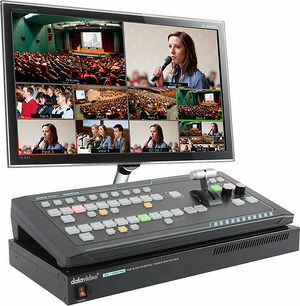 Computer Control: Switch seamlessly between video sources and blend high-quality digital content on the fl y using the SE-1200MU control interface (at no additional cost). RMC-260 Control Panel: The RMC-260 is a customized switcher style controller. All keys on the unit are clearly defi ned for quick and easy operation.